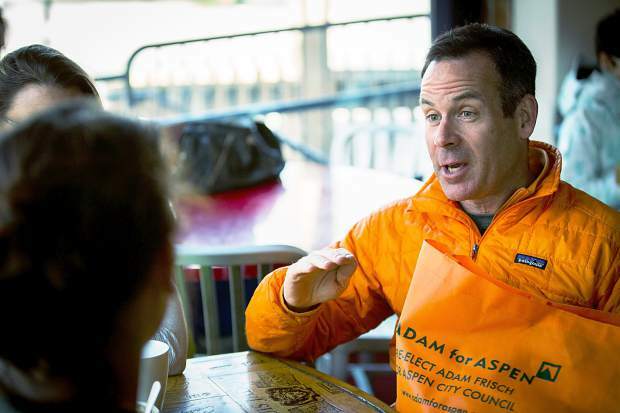 Aspen City Councilman Adam Frisch, who is seeking re-election in May, speaks with residents Wednesday at Victoria's. Frisch has raised the third most in campaign funding among seven council candidates. The release of Aspen’s first campaign finance report Wednesday showed that City Hall’s familiar faces are outpacing all other candidates in fundraising by a wide margin. In descending order, Bert Myrin, Steve Skadron, Mick Ireland, Adam Frisch and Torre have raised the most, with Myrin recording nearly $6,000 in campaign funding through the second week of April and the other four hovering around $4,000 each. Four other candidates running in the May 5 election have raised about $1,200 total, with two of the four recording zero dollars in contributions. Notable contributions to Myrin’s campaign include $500 from Blanca and Cavanaugh O’Leary, $150 from retired tax attorney Maurice Emmer and $10 from both Pitkin County Commissioner Patti Clapper and activist Lee Mulcahy. Myrin has spent about $750 of his $5,950, mostly on stickers and signs. Skadron, who is seeking to defend his mayor’s seat against challenger Torre, has spent nearly $1,000, half of which was spent on personalized M&Ms and another $300 on newspaper advertisements. Notable contributions include $250 from Belly Up owner Michael Goldberg, $250 from former Mayor Bill Stirling, $125 from hotelier Michael Brown and $100 from Sheriff Joe DiSalvo. Torre has raised $3,895, $1,000 of which came from his own pocket. Notable contributions include $250 from both Myrin and affordable-housing developer Peter Fornell. Torre has spent about $1,400. Three of the seven council candidates vying for two open seats, Marcia Goshorn, Andy Israel and Tom McCabe, have raised zero dollars, though Goshorn has contributed $150 of her own money. Frisch, who is seeking to defend his council seat, has spent more than $2,000 on orange grocery bags that carry campaign information. His expenses through April 9 totaled $3,105, while he raised $4,055. Notable contributors include Goldberg and former Councilman Derek Johnson. While Ireland has raised $4,175, he has not spent any of it through Tuesday. He has, however, contributed $250 of his own money toward paper and toner cartridges. Notable contributors to Ireland include former Councilman Frank Peters, Commissioner Rachel Richards and DiSalvo. Of the new faces appearing in the May 5 election, bartender Keith Goode is the only one to raise anything of significance through Tuesday. His campaign contributions total $1,089, with a few donations coming from co-workers at Justice Snow’s. So far he has spent $236 on a launch party. For the Referendum 1 campaign, Derek Johnson’s “Know the Facts on Referendum #1” has not raised any money, but it has spent $76 on the website AspenVoteKnow.com. Officials from the Aspen Chamber Resort Association claimed Monday that organizers had spent $47 to register the site. On Wednesday, chamber board members sent an email to its constitutes reaffirming their stance on Referendum 1. Proponents for Referendum 1 behind the “Keep Aspen, Aspen” campaign, including Myrin, Ireland and O’Leary, have raised about $1,200. The group has spent less than $6 on postage, but non-monetary contributions, such as yard signs, a website and ads, total nearly $2,500.